Buzztouch is software and an amazing community that helps people make native iOS and Android apps. Unlike many "app builders", there are no limits to what kinds of apps you can make using Buzztouch. Use the Buzztouch control panel to make an app, download the iOS or Android project, and you're off to the races. Use Xcode or Android Studio to install your app on your device. When you're happy, submit it to the App Store or the Google Play market. Native iOS and Android projects packaged up nicely for you to keep. Cool! New to the app making process? No worries. We got you covered. Whether you are just getting started or well on your way, you'll find Buzztouch community members just like you in your area or nearby to welcome you and lend a hand. Find Buzztouch friends across the pond and around the world to explore ideas, ask questions and share your experiences with others. Join us and join the fun. BtCentral is the web based control panel used to create and package iOS and / or Android apps you open in Xcode or Android Studio. We think you should own your projects so you can tinker with code if you want. BtCentral delivers a downloadable package that's yours to keep. You can host app data on our backend or host your own by running BtCentral on your own site. 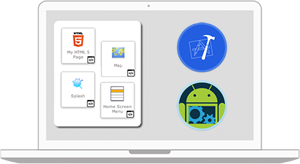 Super charge your native iOS or Android apps by adding partner SDK's to your projects.